of gas and oil law guaranteeing profits for foreign energy companies and demanding nationalization. Form Workers, Peasants and Soldiers Councils! Build the Nucleus of a Genuine Trotskyist Bolshevik Party! JUNE 1 – After three weeks of massive mobilizations, tens of thousands of workers and peasants besieged Bolivia’s central government plaza yesterday. Throughout the day, miners exploded dynamite and riot cops fired tear gas as the demonstrators fought to break through police lines to seize the center of La Paz and shut down the rightist-dominated Bolivian Congress. Up to 50,000 participated in the largest and fiercest protests since the “gas war” of October 2003. Government spokesmen threatened repression against labor leaders. The class battle is coming to a head, as the choice is posed: advance toward a revolutionary outcome or face defeat at the hands of the bourgeoisie, whether in “democratic” guise or through naked military force. Riot police fire tear gas at demonstrators demanding nationalization of Bolivia's oil and gas resources, May 27. The protests also oppose rightist demands for “autonomy” of the richest, “whitest” departments (provinces) of this predominantly Indian country. Some leaders of the peasant movement are demanding that a “constituent assembly” be called, which in reality would be a parliamentary escape valve to defuse the mass unrest. These self-proclaimed “moderates” want more royalties from the foreign-owned energy companies, as their ranks are being won over to the demand for nationalization. Recalling the army massacre of over 100 protesters two years ago, demonstrators chant: “Yesterday, bullets. Today, hunger. The solution: revolution.” Yet reformist union tops are seeking to use the mass radicalization to engineer a “civilian-military” regime, “like Hugo Chávez” in Venezuela. The desperate need of the hour is for genuinely revolutionary leadership. The splits in the ruling class and divisions among the protesters have produced a temporary stand-off. But this cannot last. Meanwhile sinister counterrevolutionary forces are gathering. Graffiti have appeared on the walls of La Paz with slogans like, “Be a patriot, kill a unionist.” Mainstream papers like La Razón taunt President Carlos Mesa as impotent for fearing that the first “muertito” (little dead person) could set off an insurrection. Avid plotting by right-wing politicians, together with unrest in the armed forces, raises the spectre of a military coup. This danger was highlighted yesterday when rightist congressmen conspicuously boycotted the scheduled reopening of Congress after a two-week “recess,” preventing a quorum. This new crisis stems directly from the 2003 “gas war,” when then-president Gonzalo Sánchez de Lozada (“Goni”), one of Washington’s regional favorites, was driven from power after his savage massacre of demonstrators touched off a workers uprising. In the absence of revolutionary leadership, the armed forces and U.S. embassy gave power to Goni’s vice president, Mesa. Taking over with words of reconciliation, the former journalist sought to divert the rage of October into empty democratic ritual. Reformist labor and peasant leaders granted the new government an “intermission.” But in the months since Mesa took office, the masses have grown more desperate while sections of the ruling class look for a “solution of force” to stifle rebellion with an iron hand. This is the revolutionary agenda that is, once again, sharply posed today. 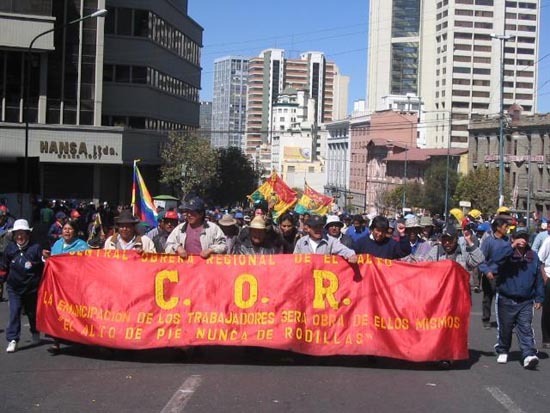 Contingent of the combative Regional Workers Center (COR) of El Alto march on May 31. The current protests were detonated on May 5, when the Bolivian Congress passed a new hydrocarbons (gas and oil) law guaranteeing imperialist energy conglomerates’ profits. This was the last straw for workers and the poor in El Alto, La Paz and other centers where, 19 months earlier, streets ran red with their blood in protests against Goni’s sweetheart contracts with the energy conglomerates. Fearing mass outrage, Mesa did not sign the new law himself, leaving that piece of dirty work to the head of Congress, Hormando Vaca Díez, a senator from Santa Cruz who leads a bloc of rightist parties intimately associated with the deposed Goni. After Vaca Díez signed the law on May 17, the expected explosion of mass discontent was immediate. Congress fled the capital and Mesa left in what one paper called “an operation quite similar to an escape” (Página 12 [Buenos Aires], 25 May). In March, Mesa said he was resigning in protest against the “crazy” demands of labor and peasant groups, only to retract his resignation and vow to stay in office until 2007. The weakness of this improvised president has led some bourgeois sectors to ask that early elections be called to replace him, while others look towards the army for salvation. The turmoil in Bolivia is generated by two main forces. One is the increasing militancy of workers and peasants demanding that the country’s huge gas and oil reserves benefit the mass of the population. The other is the “autonomist” push by bourgeois forces in the gas-producing eastern and southern regions to grab more of the fabulous wealth and keep out the Indian masses of the highlands whom these ultra-rightists disdain with undisguised racism. Santa Cruz was the base of the military dictators who ruled Bolivia for a decade after 1971. Living in poverty for generations, millions of Bolivians feel history has cheated them out of the wealth generated by the resources this country has depended on since the Spanish Conquest: the silver mines of colonial times that made Potosí a synonym for riches; the tin the British and American empires required, notably for armaments and canned food during World Wars I and II. Now the vast reserves of natural gas are exported for the benefit of “multinational” (imperialist) companies – Enron, Shell, British Petroleum, Repsol and others – while Bolivia remains the second poorest country of the Americas. Even much of the middle class fumes over the centuries of looting of Bolivia. Behind the militancy is the feeling that Carlos Mesa deceived the population with false promises of reform after taking over from Goni in October 2003. In July 2004 he held a referendum using tricky language to legitimize the gas companies’ super-profits as well as Mesa’s own unelected government. He has loyally served the imperialist corporations and the American embassy, even getting the Bolivian Senate to approve immunity for U.S. troops. Mesa gave in to “autonomy” demands from right-wing entrepreneurs in Bolivia’s richest regions, scheduling elections for departmental governors in August. Now he is visiting the Army barracks seeking support for a crackdown on the rebellious workers, peasants and Indians. A key role in propping up Mesa has been played by Evo Morales, leader of largely Quechua coca-growing peasants of the Cochabamba region and head of the Movimiento al Socialismo (MAS–Movements Towards Socialism). Morales has been lionized on the left internationally and demonized by right-wing spokesmen, but at each crucial juncture his reformist MAS has provided crucial support to Mesa. Morales put a phony “anti-imperialist” spin on Mesa’s gas referendum; today he plays with words to claim that gas is “already” nationalized through royalties and taxes. There are also the envoys sent to La Paz by the popular-front government of Lula in Brazil and Peronist Argentine president Kirchner, acting as firemen for Yankee imperialism to put out the flames of revolution in the region. The second motor force of current turmoil comes from the right, with demands for regional “autonomy” raised by the “Civic Committee “of Santa Cruz de la Sierra department in eastern Bolivia, bordering Brazil, and Tarija department bordering Argentina in the south. The Santa Cruz capitalists and landowners are taking a page from slaveholders in the U.S. South by threatening to secede if their demands for even more wealth and power are not satisfied. The more Mesa gives in to them, the more they demand. After the president acceded to their agitation for election of a new governor, they used this to call their own “autonomy” referendum. 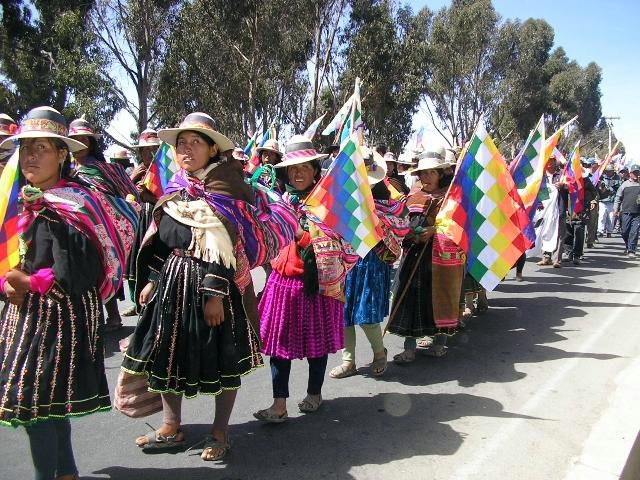 While the Santa Cruz elite sometimes couches its demands in democratic phrases, they are openly racist: as one of Bolivia’s “whitest” regions, they want “autonomy” from the protests launched by Indian miners and peasants of Bolivia’s western altiplano (high plateau). In this sense, their “autonomy” demands are the very opposite of calls for autonomy by oppressed peoples like the Indians of Chiapas, Mexico. What the cruceña bourgeoisie wants is a bigger slice of the dollar profits from gas and oil production centered in this region. Meanwhile, the regional bourgeoisie faces conflict in its own backyard. Yesterday, demonstrators in the capital of the department of Tarija took over congressional delegates’ offices in solidarity with protests on the altiplano. Last month in Santa Cruz, soldiers and police evicted eighty families, members of Bolivia’s Landless Peasant Movement (MST), from an hacienda in the Los Yuquises region. Representatives of the Guaraní and other indigenous peoples of Bolivia’s east denounce discrimination by the local authorities, stating that if Santa Cruz and other eastern regions get autonomy, they want to separate from them. For his part, Evo Morales of the MAS is pleading for “consensus” between the “agenda” of the La Paz protests and the “agenda” of the Santa Cruz bourgeoisie. The mechanism is supposed to be a constituent assembly. The MAS has long called for such a body to rewrite the Bolivian constitution, hoping to get a bigger slice of power. The promise to call a constituent assembly was one of the crucial means by which Mesa worked to defuse the October 2003 uprising. This is hardly a revolutionary demand in Bolivia, which has had at least a dozen constituent assemblies since independence. The idea that Bolivia’s bitter class struggles over wealth and power can be resolved through this supposedly democratic mechanism is a reformist utopia of class peace. It is no wonder that the constituent assembly plan is approved by the World Bank! This is not a case of popular masses rising up against a dictatorship or monarchy, or entire sectors excluded from formal parliamentary democracy, in which calls for a constituent assembly can be appropriate. 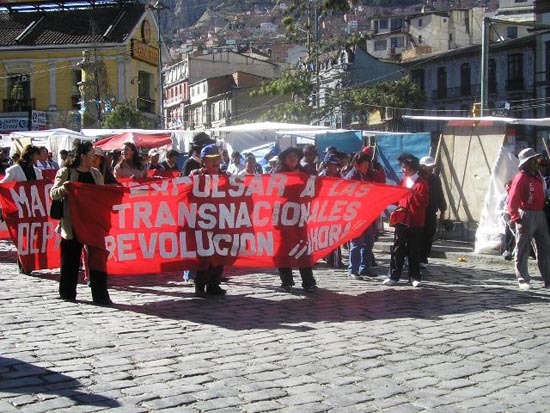 What is starkly posed in Bolivia today is workers revolution or capitalist counterrevolution. The eastern bourgeoisie seeks to turn its region into a Bolivian version of the reactionary Vendée which opposed the French Revolution of 1789. They must be decisively defeated, not conciliated. In Bolivia today, the call for a constituent assembly is a counterrevolutionary trap, which must be opposed by the struggle for a successful workers revolution. What is urgent today is to form workers councils (like the soviets of the Russian Revolutions of 1905 and 1917). Such councils can draw in the urban and rural poor, indigenous peoples, youth and oppressed women, and rank and file soldiers unwilling to carry out the murderous orders of the bourgeois officer corps. With social agitation at a fever pitch, workers, peasants and soldiers councils can and should be formed now as a concrete step to take the struggle forward from the current stalemate. 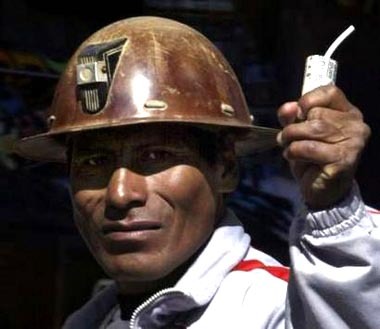 While the pieces of dynamite used in demonstrations make a loud noise, they are no substitute for the arming of the working class: workers and peasants militias are crucial to defend the Bolivian working people today. To rip the gas and oil resources out of the capitalists’ claws, rather than looking to the parliamentary politicians or a bourgeois nationalization, the working class “should seize the oil, mining and gas facilities, imposing their expropriation without compensation and workers control by the ranks of production and distribution,” as we wrote in 2003. The only way out is a workers, peasants and Indian government based on this proletarian democracy of workers councils. 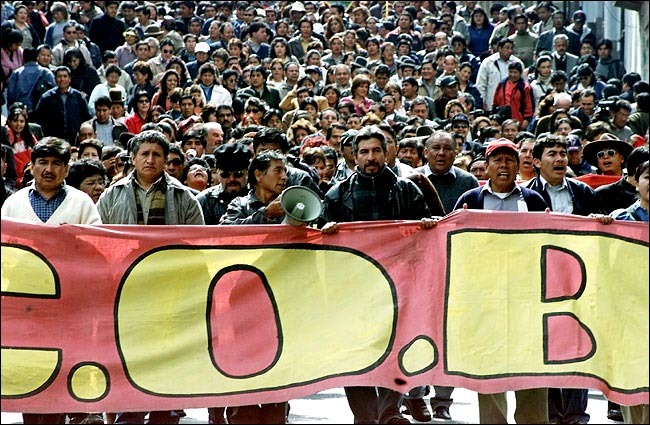 “Obreros al poder!” in Bolivia can be transformed from a slogan to a reality only as part of the fight for an Andean federation of workers republics, a socialist revolution that extends to the workers of the imperialist centers as well. Coup rumors multiply by the hour, centering on the figure of rightist Santa Cruz senator Hormando Vaca Díez, who according to the constitution would be next in line to succeed Mesa if the president stepped down (just as Mesa put on Goni’s tricolor presidential sash when his former boss fled for Miami). Yet this is only one variant in the many scenarios for a possible coup d’état in a country that had so many military takeovers it was often called “Golpilandia” (Coup-Land). For almost two decades liberals have spread the illusion that such coups are a thing of the past, but the purpose of the capitalist armed forces is precisely to use organized violence in defense of the power and wealth of the ruling class. It is not for nothing that in Bolivia, the symbol of the Military Police is a ravenous bulldog menacingly baring its teeth. Yet fatal illusions in capitalist officers and police are spread by leaders of workers, peasant and “left” organizations. Evo Morales of the MAS demagogically calls for army and police to occupy the oil and gas fields. Jaime Solares of the COB has repeatedly called for an “alliance” with “patriotic” military officers and support for “an honest military officer like Hugo Chávez” of Venezuela. In speeches against last year’s referendum, Solares grotesquely boasted of contacts with generals who wanted a tougher line against the “threat” from Chile (which won Bolivia’s seacoast 125 years ago in the War of the Pacific). Suicidal illusions in “patriotic military officers” have been put forward as well by the Miners Federation leadership, which explicitly hailed two army colonels, Julio Herrera and Julio César Galindo, who made a pronunciamiento on May 26 proclaiming a “Generational Movement” and offering to lead a civic-military junta in which “we young officers would take charge of this country’s government.” Support for a military man on horseback to “save the nation” is an old path in Latin America, covered with corpses of the workers and oppressed. Most recently in Ecuador, former colonel Lucio Gutiérrez used populist demagogy to rope in labor, peasants and the left, only to turn against them in the service of Washington and the International Monetary Fund, as the League for the Fourth International warned he would do. COB officials have also harked back to the 1970-71 Bolivian regime of General Juan José Torres – when the left and labor movement formed a “Popular Assembly” whose illusions in Torres’ military populism paved the way for the bloody rightist coup of Hugo Banzer. This policy of class collaboration crystallized in the “Anti-Imperialist Revolutionary Front” (FRA) formed in exile by Torres, other officers, and almost all the Bolivian left, most prominently the main organization falsely describing itself as Trotskyist, the Partido Obrero Revolucionario (POR – Revolutionary Workers Party) of Guillermo Lora. A smaller centrist organization that calls itself Trotskyist is the Liga Obrera Revolucionaria–Cuarta Internacional (LOR-CI – Revolutionary Workers League-Fourth International), affiliated to the Fracción Trotskista led by the Argentine PTS. 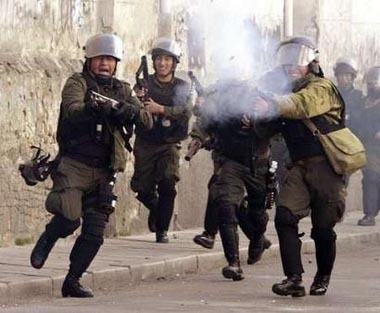 The LOR-CI has spread its own illusions in the possibility of the police “committing themselves to the defense of the workers and the people” (Lucha Obrera, 24 February 2003). * Its trademark, however, has been to add the adjective “Revolutionary” to Evo Morales’ demand for a Constituent Assembly. Constituent assembly fetishism follows the tradition of Nahuel Moreno, the Argentine pseudo-Trotskyist from whom the PTS/LOR-CI tendency is derived. In the 1980s, Moreno called for “democratic revolution” in Latin America and for “new February revolutions,” referring to the February 1917 overthrow of the tsar. Genuine Trotskyists fight for new October Revolutions. The key lesson of the 1971 Popular Assembly is precisely that it tied the workers to Torres, doing nothing to prepare them against the Banzer coup. On the programmatic level this sellout was prepared by the so-called “socialist theses” passed by the COB in 1970, which in a deal between the Stalinists, the POR and others, mixed leftist phrases with calls for “an anti-imperialist popular front.” Yet today, the LOR-CI calls for a program “based on the best contributions of historical COB documents like the Theses of Pulacayo and the Socialist Theses of 1970” (LOR-CI declaration, 21 January). More than any other country in Latin America, Bolivia’s political language has been influenced by what is widely considered “Trotskyism,” going back to the Theses of Pulacayo written by the POR and approved by the miners union in 1946. This is both a product of, and a factor contributing to, the enormous combativity shown by generations of Bolivian workers. Yet at each crucial juncture, those laying claim to Trotskyism subordinated themselves to nationalist bourgeois politicians and military men. That is the opposite of the real content of Trotsky’s program of permanent revolution, which addresses just such situations as that of Bolivia today. As Trotsky concluded from the experience of revolutions in Russia and China, the fundamental problems of a semi-colonial country like Bolivia can be addressed only through a revolution in which the working class seizes state power, supported by the peasantry and the urban poor. Only socialist revolution can break the stranglehold of imperialism, resolve the land question (including expropriation of landed estates in Santa Cruz, untouched by the agrarian reform of Bolivia’s 1952 National Revolution), and win real democratic rights for the oppressed, first and foremost Bolivia’s indigenous majority. As Trotsky stressed, this permanent revolution must open the road to genuine socialism – a classless society of abundance – through its extension to the industrially advanced centers of world capitalism. The key is to build an authentically communist workers party to head the struggle. Neither populist military officers nor a “constituent,” “revolutionary constituent” or “popular” assembly, but the revolutionary class power of workers soviets and militias is what is required to lead the masses of working people, peasants and all the oppressed to victory over the dangerous enemies confronting them today. This means a political struggle against the current leaders, who seek ever new ways to promote the old bourgeois nationalism, playing on the country’s relative geographic isolation and remoteness. The workers of Bolivia are not alone. This new upsurge occurs in the context of increasing turmoil in Latin America. In Ecuador, the military populist Lucio Gutiérrez is the latest of a series of presidents driven from power in recent years. In Brazil, class collaboration has shown its bankruptcy anew as Lula’s popular front faces bitter disaffection from the working class. Peru has been shaken by a series of local rebellions. Labor strikes and political crises have wracked Mexico. In the United States, where workers face the repressive “home front” of the imperialist war on Iraq, a dynamic and growing sector of the working class, immigrant workers, forms a “human bridge” to upheavals in Latin America. Only an internationalist perspective, for extending revolution throughout the Americas and world-wide, can confront the danger of imperialist intervention faced by any genuine revolution. International socialist revolution was the program of Lenin’s Bolsheviks, who led the Russian workers to power under the slogan “All power to the soviets!” and, with the Red Army led by Leon Trotsky, defeated the armed intervention of more than a dozen capitalist powers. This program was carried forward by Trotsky’s Fourth International, which we fight to reforge. * In response to our criticisms of its line on the February 2003 police mutiny in Bolivia, the LOR-CI accused us of falsifying their position (in Revista de los Andes, Fall 2004). After being shown quotations from their paper, LOR-CI cadres conceded that our criticism was not only accurate but politically correct. To our knowledge, however, they have yet to publish the correction they vowed to print on this matter.